France is the top ski destination for UK-based holidaymakers says HomeAway.co.uk, the UK’s leading rentals holiday website. With around 545,000 self-catering properties in its portfolio, the company revealed this news while also announcing the most popular French resorts. In first place is the legendary resort of Val d’Isère in the Tarentaise Valley, where the village itself sits at an altitude of 1,850 metres. Offering a long ski season from November to May, it is renowned for its varied terrain and offers some of the best skiing and snowboarding in the world. It is known to be a super resort for beginners as there are more than ten ski schools to choose from, but with 25 black runs and Olympic downhill runs it is the destination of choice for many advanced skiers too. 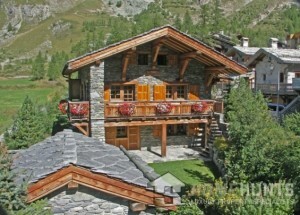 Along with its higher neighbour Tignes – which HomeAway.co.uk report is its third most popular resort – Val d’Isère makes up the famous Espace Killy. This area offers more than 300km of runs, including the off-piste variety, where the most exhilarating ski opportunities can be discovered. Tignes is particularly snowboarder friendly, but is known for being able to meet the needs of most skiers and snowboarders. Home Hunts has some stunning properties available in Val d’Isère and Tignes. A fine example of high quality, traditional chalet architecture (HH-7356502), this property was built originally as the personal home as one of Val d’Isère’s most reputable chalet builders. Warm and homely with no expense spared on fixtures and fittings, this four-bedroom property, with a garden and balcony, is also south facing. It is priced at €5,000,000. This ultra-modern, stylish and cleverly-designed chalet (HH-7366961) in Tignes has been designed and built by one of Espace Killy’s most renowned skiers. Offering five bedrooms in total – as there is also a separate duplex apartment attached to the property – and with a top floor entirely dedicated to living, this residence has been designed with luxury in mind. 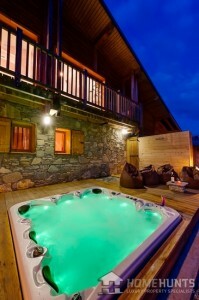 The Jacuzzi terrace and views make this €1,600,000 property an irresistible investment opportunity. While the Tarentaise Valley has managed to score two resorts in HomeAway.co.uk’s most popular French ski resorts, in second place is Chamonix, one of the best-loved ski resorts in the world. The site of the first Winter Olympics in 1924, it is also one of France’s oldest resorts and is famous for being home to Europe’s highest cable car ride at the Aiguille du Midi. Recently Chamonix hit headlines for the opening of a glass see-through box, called “Step into the Void”, which has been constructed 3,842 metres up on the Aiguille du Midi. Those brave enough to enter say they feel as though they are suspended on air amid the panoramic views of the breath-taking Mont-Blanc massif. 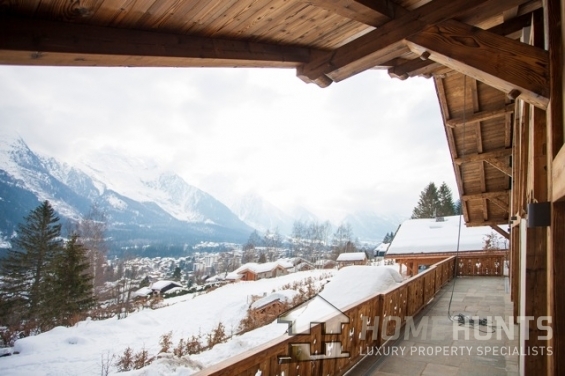 This stunning four-bedroom chalet (HH-6032615), located just minutes from Chamonix’s golf course and Flégère cable car, is dream chalet material. Beautifully constructed against the backdrop of the mountains – and with a luxuriously-designed interior and garden – this property is competitively priced at 2,750,000 and will be sold fully furnished. 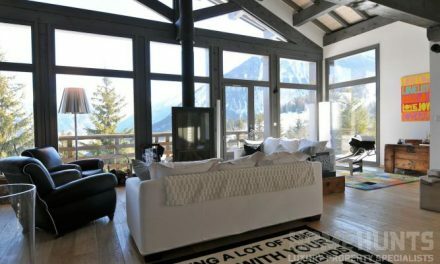 HomeAway.co.uk’s research shows that Les Deux Alpes, France’s second oldest ski resort behind Chamonix, makes fourth place. Fifth place has been taken by the Three Valleys, which comprises eight famous ski resorts including Courcheval, Meribel and La Tania. For further details about these properties visit www.home-hunts.com. To find out more about off-market luxury chalets in these Alpine ski resorts, contact the French office on +33 (0)970 44 66 43. PreviousChinese buyers set to benefit from French fast-track visas…. NextWhy and where will France’s prime property market grow in 2014?